Consumer-based intelligence is an important element of any marketing strategy as it provides a cost-effective analysis of the "big picture" and is an essential reference guide. We are compiling a library of pre-packaged market and consumer intelligence reports for the Personal Care Industry. We are also able to create customised intelligence reports based on your specific requirements to provide actionable information on a specific: country, market or consumer segment. 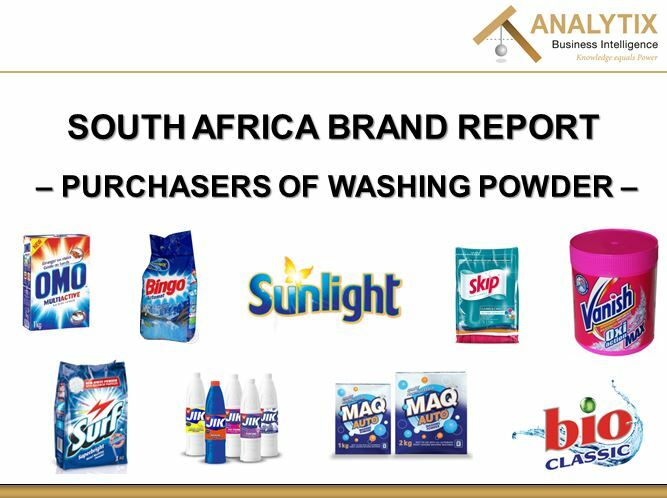 This comprehensive report examines South African purchasers of Washing Powder: Global and South African market overview purchasing and brand trends (2009-2013) with purchaser forecasts for 2014-2018, Geo-demographic trends among purchasers compared to the total adult population (2009-2013), Detailed geo-demographic brand profile and brand penetration analysis, Cellphone and Internet usage and Shopping patterns.